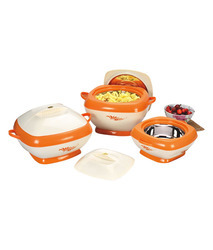 Our range of products include insulated casserole set and orange square casserole set. 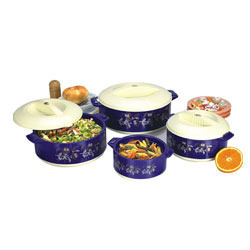 We are engaged in manufacturing, supplying and exporting an exquisite range of Insulated Casserole Set. All these sets are manufactured using high quality food grade plastic that is sourced from reliable vendors of the market. Our range has maximum temperature retention properties and stainless steel inside lids. These products come with a unique silver and gold ring with a variety of stylish colors. 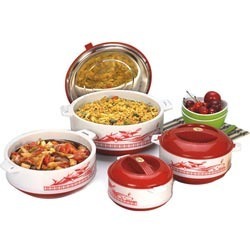 Being a client-centric organization, we have emerged in the market as a manufacturer, supplier and exporter of a wide range of Insulated Casserole Set. Manufacturing in conformity with the international quality standards, these products are widely reckoned in the industry. Excellent for carrying various snacks and food items. Capacity: 500, 800, 1500 and 2500 ml. 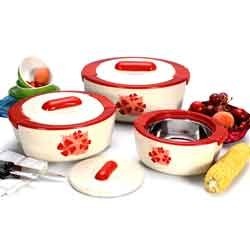 Owing to our vast manufacturing facilities, we are able to manufacture, supply and export optimum-grade Insulated Casserole Set. All these hot pot sets are manufactured using high grade material so that these are in compliance with international quality standards. Clients can avail our range in a spectrum of colors, designs and sizes at industry leading prices. Positioned amongst the distinct manufacturers, suppliers and exporters, we are engrossed in offering our clients with Orange Square Casserole Set. Our offered set is designed and developed at our vast infrastructure unit which is laced with latest tools and cutting-edge technology. Can be availed in different colors and sizes, these products are widely appreciated. With an aim to gain maximum satisfaction of our customers as a manufacturer, supplier and exporter, we are engaged in offering our customers with Insulated Casserole Set. In the supervision of our dexterous professionals, we undertake our production process to ensure no defects. Moreover, we offer these products in at industry leading prices. 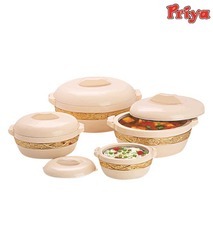 Our organization is a well-known manufacturer, supplier and exporter of a wide range of Insulated Casserole Set. 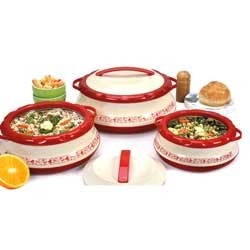 The casseroles sets offered by are manufactured employing latest machinery and technology. Post-production, these casseroles sets are checked on the basis of strength and finish to ensure flawlessness.